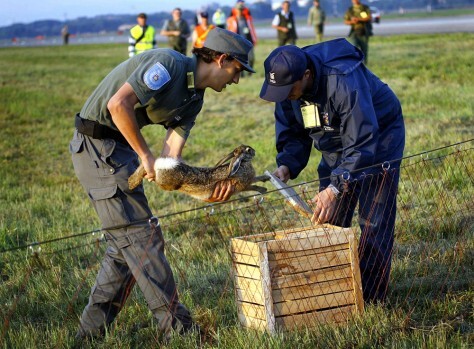 A hare is caged early Sunday after being captured on the Linate airport runway in Milan during a three-hour hunt. The airport was forced to close between 5 and 8 a.m. and 12 flights were rescheduled while 200 volunteers used nets to capture the hares and move them to a safe haven. More than 50 hares were caught.